Enjoy the out-west atmosphere with back-east convenience for some of the finest western-style horseback riding in the area. 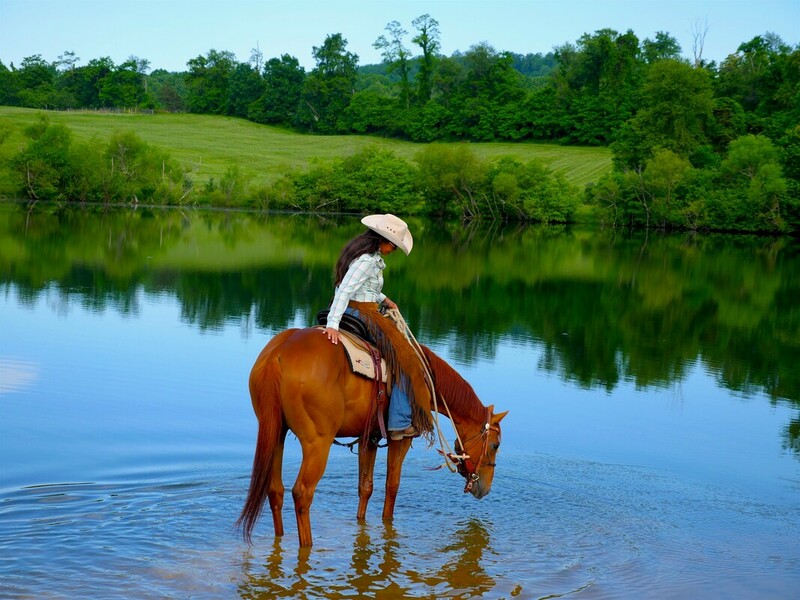 Located just fifty miles west of the Capital Beltway, the Marriott Ranch offers a variety of horse-related activities, none more popular than our ninety-minute trail rides across parts of our beautiful 4,200-acre working cattle ranch. Located in the foothills of the Blue Ridge Mountains, riders will enjoy themselves whether riding through pastures, across creeks, and through peaceful woods. *All reservations are made on-line and are confirmed through a confirmation email. We're unable to accommodate "walk-ins". Interested in an extended stay here at the ranch? Call 540-364-2627 for availability at the Bed and Breakfast and email naturalconnectionprogram@gmail.com to set up multiple days of memorable riding experiences! All trail rides require advance reservations. Visit The Natural Connection for more information and bookings. 90 minutes in the saddle includes mounting, instruction, warm up, time can include instruction on the trail, if confirmed balanced at trot, then potentially canter, and cool down. Great for the rider wanting to learn on the trail or the knowledgeable rider wanting an enjoyable outdoor riding experience! Picnic lunches are available for purchase. Please fax your order to ﻿540-354-3564﻿ or call 877-324-7344x3 to order. *Children must be at least 10 years of age to ride. Not available for groups. Available only by request and subject to availability. *Children must be at least 16 years of age. Enjoy three days in the saddle while taking in some breathtaking scenery on J. W. Marriott's working cattle ranch. Guests will learn basic horsemanship skills and ride through our cattle herds. Includes both arena and trail riding. Guests will be entertained one evening by local musicians. Bring a fishing pole for the our three stocked farm ponds! With a half-day tubing trip on the Shenandoah River, leisure time to explore Shenandoah Natural Park, and plenty of time for exploring local wineries - you'll want to do it again next year! Check-in is on Monday at 4pm, departure is on Thursday afternoon. All horseback riding, meals and lodging are included. Don't miss these specialty rides! Saddle up for a horseback adventure as your guide takes you on a scenic ride that passes through the Angus Cattle Operation and includes a stop for lunch. Rides start at 10 am and return at 3 pm. A boxed lunch is included. *For private groups of ten or more, contact Kelley Moss at kmoss@marriottranch.com or 540-631-5018. Enjoy a leisurely guided trail ride, grilled steak dinner and guitar entertainment. Rides leave barn at approximately 4pm, guests are asked to arrive by 3:30pm. All rides require advance reservations. Visit The Natural Connection for more information and bookings. ​*For private groups of ten or more, contact Kelley Moss at kmoss@marriottranch.com or 540-631-5018. GPS Alert! Please see our directions & map for driving directions. Some GPS devices prefer the "back way" - a LONG way! Maximum weight limit is 240 pounds. We require all of our riders to sign a release form prior to riding. Please click here for a copy of our Trail Ride Release.